According to Ayurveda, water stored in a copper vessel has the ability to balance all the three doshas in your body, (vata, kapha and pitta) and it does so by positively charging the water. This process is called Oligodynamic effect which has the ability to destroy a wide range of harmful microbes, molds, fungi etc. The water stored in a copper vessel is known as 'tamara jal' and is supposed to be consumed after storing the water in a copper vessel for at least eight hours. For thousands of years, people of India and many other Asian countries have known the benefits of drinking water from Copper Vessels. Ancient Ayurvedic scriptures have stated many health benefits of storing water in copper vessels. Now, the current medical studies are also supporting this ancient Ayurvedic practice. Here is a guide to help you in buying the right kind of vessel. One very easy way to distinguish between pure copper and an adulterated version is to know that copper is a very soft metal and pure copper is difficult to mould into intricate shapes. If the design of your copper vessel is very complicated or detailed, it is most probably not made with pure copper. Do not use a coarse scrub to wash the inside of the vessel as it will tend to scrape away copper from the vessel. Instead, use one half of a lemon (you can squeeze out the juice) and rub it on the inside of the vessel. Allow it to stand for a few minutes and then wash off with plain water. You can also use baking soda with water. Coat the the inside of the vessel with this mixture and allow it to stand for a few minutes then rinse away the excess baking soda. Copper is not naturally utilized by our body thus too much of the metal can be detrimental. As per the FDA, about 12 mg/day is more than sufficient for the body to use without causing any harm. Do not abuse this exercise. Drinking water two or three times a day from a copper vessel is more than enough to procure its benefits. 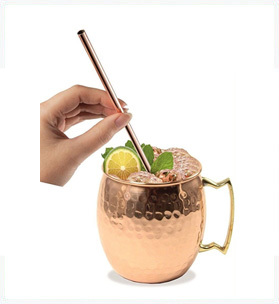 Remember you should not drink this copper vessel water all year long. Once you start drinking water stored in a copper vessel you can continue this practice for three months and then take a break for one month. After a one month break, you can continue drinking water again from a copper vessel for next three months. This gives our body time to cleanse any excess copper deposited in our body. The body has its own mechanism of eliminating the excess of anything. Ayurvedic rules are very precise and if we follow them accordingly we will never get any side effects. Note: information in this article and website is not a substitute to professional medical advice, diagnosis or treatment. Always ask physician or other qualified health providers before making any diet or lifestyle changes.